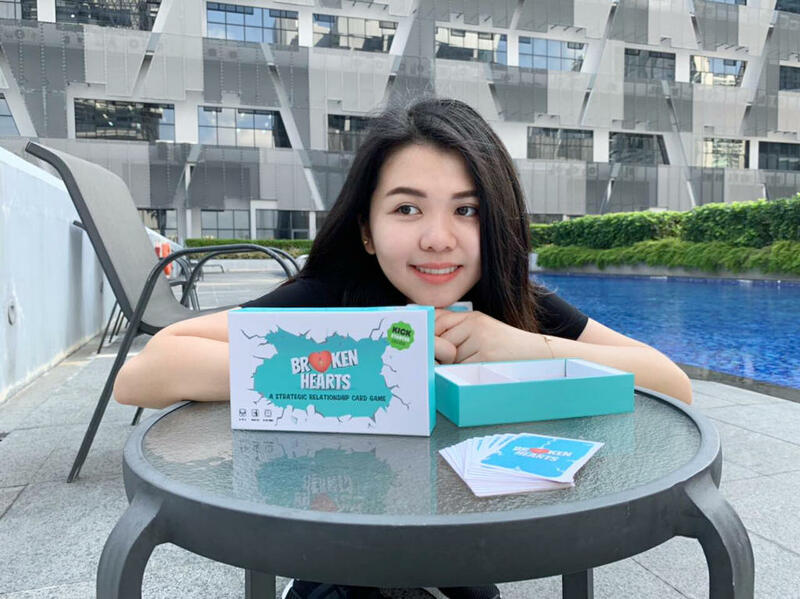 SINGAPORE — Rather than mope over her failed relationship, one 24-year-old channelled her heartbreak into creative energy which she hopes will benefit others.Banding with two of her friends, Ms Teh Jo Ey created a new card game called Broken Hearts to inspire others in the same boat to love again. On Wednesday (Oct 24), the trio will launch their campaign on crowdfunding site Kickstarter to raise S$15,000 to produce the card game. The target sum is the minimal needed for them to break even, said Ms Teh.Anyone who pledges at least S$39 will be able to get a set of Broken Hearts — meant for players above age 13 — by March next year. Ms Teh, a community manager at a co-working space, said the campaign will last till the end of November, following which the team will need about two months to churn out at least 1,500 sets of the game. “People tend to hide their emotions and do not want to face their broken hearts,” the petite 24-year-old Singapore permanent resident told TODAY.That was certainly her own experience. Her year-long relationship came to an abrupt end last year after her ex-boyfriend, a Singaporean whom she met online, walked out on her.“He left without a word, and it was a hard time for me as I couldn’t get any closure,” the Malaysian said.After some time, she tried reaching out to him, and his subsequent response left her perplexed. In a text message, he told her she was “too good for him”, which was why he left. It was at her lowest point that she learnt how to be “comfortable with all the uncomfortable”, and found the courage to embark on something meaningful: “to spread love to the world”. The idea for the game, however, came one day shortly after her break-up, when Ms Teh shared her experience while out at lunch with two friends she made at work. Her co-workers — Ms Keely Sim, 25, and Ms Thoo Seik Yee, 30 — were surprised to hear that she was trying to get over a fail relationship as they said she “bore (her) heartbreak well”. That sparked a discussion about creating a practical and fun way to bring people together — and Broken Hearts was born.Ms Sim contributed to the game design as well as the art illustration, while Ms Thoo was in charge of the creative aspects of the game and the website. Ms Teh became the project manager. They officially began work on the card game in January this year, and finalised the details of the game earlier this month.Speaking on behalf of the team, Ms Teh said they chose the name Broken Hearts as they felt it is something everyone would go through at some point, and they hope people playing it can be “brave to face their broken hearts and fall in love with life again”.She said they had tested the game with more than 200 people, and it was met with warm reception as it made people laugh. Four to six can play this game; each session is expected to last at least 15 minutes.The deck comprises 96 cards, made up of three types of cards: the Heart cards, Action cards and Special cards. For each game play, every player will be dealt seven cards at the start, and will have to draw a set number of fresh cards at each turn.The goal is simple: the first player to link five unique pairs of Heart cards with the other players (or oneself), wins.To form a connection with a player possessing a Heart card you need, Ms Teh says the individual needs to play his Action cards, such as the “I Like You” card to seal the deal. There are multiple ways to prevent your opponent from winning. Players can be rebuffed with the “I Hate You” card.The game can be made even more complex by playing other Action cards that forces someone to skip a turn, steal an opponent’s card, force him to show his hand, or even break up a connected pair with a “Broken Heart” card.Drawing or playing the Special cards would force players to discard all their cards, exchange their cards, or require one player to sever the connections of one of his Heart cards - and everyone else must sever the same card if they have it and it is linked to someone else.Once a deal has been struck between two players with a similar Heart card, both must perform a set of symbolic actions written on their cards. These actions include the Heart Sign (making the shape of the heart with two fingers), the Pinky Promise (hooking pinkies together), and even the Flirty Wink (winking at another flirtatiously).“All these physical interactions mean something — the expressions of love. They break down the walls and create laughter,” said Ms Teh. She added that that by doing these actions, she hopes it will allow the players to take their first step to be brave and love again. “Have you ever blown a kiss to your friends? Have you ever made a pinky promise with your family? We hope Broken Hearts can increase the quality time with (the players’) loved ones, friends and even family,” Ms Teh said. As part of their launch campaign, the trio plan to hold a launch party on Wednesday at Basecamp Cafe at Marina Bay MRT station from 7pm to 10pm, where interested players can experience the game firsthand. While the trio currently have no further plans if their crowdfunding campaign does not pick up, Ms Teh is optimistic.“We believe that with love, this project can spread to the world,” she said. 0 Response to "24-year-old creates card game to get over failed relationship and help others deal with broken hearts"